Patchwork, comforters and quilting are words that almost seem synonymous. 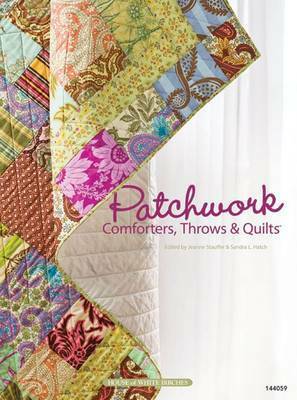 In this book, we are using the word comforters loosely to include everything from a blankie for a toddler to a shawl for a cancer victim or a lap quilt for your favorite charity or community need. Quilters who love to piece quilts will be delighted with the variety of projects in this book. We've included several foot warmers: quilts that are long and narrow. They're just the right size to fit across the end of the bed or to wrap around the shoulders of someone in need of comfort. There are traditional designs with an added twist for quilters who love the classics, but also enjoy trying something new. Quilters who want more of the look of today will discover quilt designs that have an "arty" look, but they don't require the talent of a professional artist to create these unique quilts. Fun quilts that feature kites or Jacks or hearts will satisfy the quilters who are looking for a new quilt design to make for the younger set. Each chapter will start with a super easy project. These projects are great for beginners, for quilters who are busy and want to make a quilt quickly, or quilters looking for projects to make for community quilts. Several easy- or intermediate-level projects and, in some chapters, a project for the experienced quilter are also included. To help quilters have more time to quilt, many of the projects use today's popular fabric cuts: 2 -inch rolls, 1 -inch rolls, 5-inch charms and 10-inch squares. Patchwork designs are the focus of the book, but the book also has a few projects with the added feature of applique, including three-dimensional applique. Quilters who want to use fabrics from their stash to make new projects will find several scrap quilts and throws. Original quilting designs for hand-quilting and machine-quilting are also included. There are 42 projects in the book; 42 quilts in a variety of sizes to decorate your home; 42 opportunities to make a quilt for someone else. That adds up to hours and hours of quilting enjoyment. Jeanne Stauffer has been quilting for over 20 years. Sandra Hatch has been quilting since she was a child. Together they have edited over 25 quilt books.